Mars is called the Red Planet because it's predominantly red, of course. But that hasn't stopped NASA from taking some blue photos. NASA's Mars Reconnaissance Orbiter (MRO), which hovers over 160 miles (255 kilometers) above the surface of Mars, recently sent back a photograph of a patch of blue on the Red Planet when it came across some dunes in the Lyot Crater. 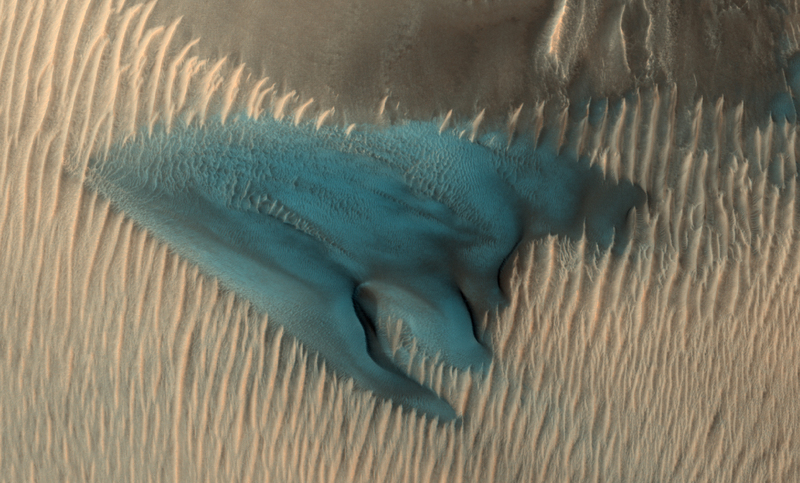 The electric blue color comes from NASA enhancing the image to better show the dune's composition. This dune was found among a series of barchan dunes - simply a term for sand dunes with a crescent shape - which NASA directed the MRO to examine. While not crescent-shaped, this dune is made of a much finer material and has a different composition than the more standard barchan dunes surrounding it. The reason for the enhanced coloring is because the MRO's camera, the High Resolution Imaging Science Experiment or HiRISE, can take photographs at wavelengths broader than what the human eye can see naturally, and often takes photos in infrared. Since there's no way to easily translate infrared colors into anything we humans are capable of seeing, enhancing the image is often necessary. HiRISE is responsible for a number of striking images taken on Mars, and the MRO's high location and mobility provides a lot more opportunities for photo ops than the rovers patrolling the Martian surface (especially since they're both caught in dust storms right now). This dune photograph was originally taken back at the end of January 2018, but NASA only just got around to releasing it - had the photo been taken recently, it would look blurrier due to the aforementioned dust storm which is currently encircling the entire planet. So rest assured, Mars is by and large a red planet, even if it may have been green a very long time ago.